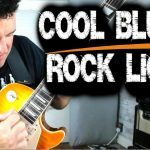 With this rock ballad backing track you can practice playing epic, melodic, expressive, emotional guitar solos. The backing track is in the key of C# minor and is similar to many classic rock ballads such as ‘Comfortably Numb’ by Pink Floyd. So grab your guitar and let those emotional and melodic rock licks flow! 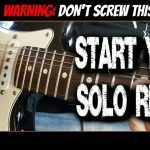 When soloing over this ballad backing track you’ll probably want to use scales like C# minor pentatonic or C# natural minor scale. Both will work well in this setting. Notice which notes in the scale sound good when you bend them…this is an important part of rock soloing in a ballad setting. You can also focus in on some of the notes in any C# minor chord shapes you know. These can also for the basis of some great melodic guitar licks. Tips for playing a guitar solo over a rock ballad: use lots of space, use lots of string bends, try to use the full range of the fretboard, use repetition to build structure in your solo and think about how to get a singing ‘vocal like’ sound using slides, bends and other legato techniques.